There is no design control, no procurement document control, no controls on materials and purchases, no control equipment ( . . . ) Who is going to operate this plant? The indispensable international requirement for operation of a nuclear reactor is that the operator be trustworthy that people believe that this person will respect international law and will be capable of operating and maintaining this plant with strict compliance with safety standards ( . . . ). It is obvious that Fidel Castro does not meet any of these requirements. Since the late 1970s, Cuba has pursued a nuclear energy capability by attempting to build two nuclear reactors at Juraguá, in Cienfuegos province. These policies were ambitious by any measure. Originally, Cuba envisioned a network of nuclear reactors across the island.When completed, the nuclear facilities would represent a shining example of the success of the Cuban revolution, highlighting developments in technological and scientific expertise. The plans for nuclear development have undergone numerous changes and reevaluations until 1992 when the project was placed in a state of “suspension” because of the loss of Russian financing for construction. About this same time numerous questions had been raised surrounding the safety of the partially completed reactors, as well as the competence of the Cuban nuclear bureaucracy that would be left to operate the plants. The quotation above represents the depth of doubts that follow Cuba’s attempt to develop a nuclear capability. These doubts, coupled with the suspect economic value of nuclear energy development on the island, pose more questions than they answer. The purpose of this examination will be to provide a cost and benefit analysis of Cuba’s nuclear project that looks at how the economic, political, and nuclear safety issues surrounding development of nuclear energy may affect the environment. This can be viewed as a part of the Cuban “quest for power.” It can also be viewed as part of a broader body of research that looks at the relationship between natural resources, economic development and environmental policy in revolutionary Cuba. 1 It is also an attempt to provide an objective analysis of an issue that heretofore has often been the fodder of many of the less than complimentary exchanges between Havana and Washington. Because it has been used in this propagandistic fashion, much of the credible scientific and political analyses needed for sound decision-making has been forsaken for the expediency of accumulating political capital. A sound analysis requires that we remind ourselves that environmental problems deserving our attention do not necessarily exist “today” but are (at least potentially) in prospect for the future, whether near or distant. Moreover, we must take into consideration under the present circumstances that even the most thoughtful opprobrium to Cuban nuclear aspirations from the United States may have little influence on Cuba. Before engaging in analysis it is useful to place Cuba’s nuclear ambitions into a proper historical context. The following section provides a brief examination of the historical development of Cuba’s nuclear program and its associated policies. 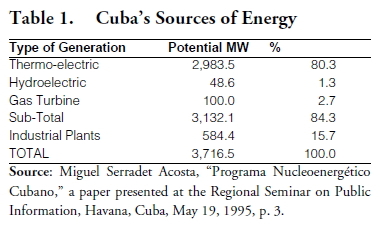 In retrospect, an analysis of Cuban nuclear activities suggests that officials involved in initiating the nuclear program gave primary consideration to political reasons, viewing potential economic dividends as important but less significant. 2 Moreover it bears to reason that little or no emphasis was placed on all of the parallel nuclear bureaucracies and institutions usually associated with the development of a nuclear power industry. Environmental imperatives lay outside these core considerations and would not be emphasized until after the disaster at Chernobyl. As a by-product of nuclear ascendancy, Cuba could lessen its dependence on oil imports, thereby developing a stronger bargaining position with the Soviets and diminishing the impact of the U.S. embargo. Cuba’s domestic oil production is roughly one and a half million tons annually. 8 The amount required to meet its basic energy needs is eight million tons annually. Under the old trade agreement with the Soviet Union, Cuba received thirteen million tons of oil annually. This arrangement allowed Cuba to resell the five-million-ton excess and to export six and a half million tons of oil annually. 9 During the “special period” Cuba has been able to generate only 30 percent of its energy requirements. The severely diminished output has resulted in blackouts, limited telephone service and the extensive shutdown of factories throughout the island. The peak energy use on the island is estimated at about 1,500 megawatts per hour. The addition of a 417-megawatt reactor to the grid would partially reduce the impact of the loss of Russian oil. This study employs a benefit-cost (BC) analysis as the evaluative criteria. 10 BC conceptualizes the domain of benefits accrued to a society (valued by the society itself) in terms of their utility. BC views the nuclear policy problem as involving some production relationship between scarce and highly constrained resources (economic and natural) and beneficial outcomes. This type of analysis also allows for those resources and benefits to be variable in scale. The choice of one policy alternative does not necessarily mean that all other considerations impacting the decision making process are eliminated. Far too often in the debate surrounding Cuba’s nuclear ambitions a zero-sum relationship is established muting the possibility of resolving any of the issues at hand. The most important criterion is that the projected outcome solves the policy problem to an acceptable degree. The present condition of U.S.-Cuban relations requires us to assess the impact with a judgement on our part whether and why a given alternative is thought to be desirable and by whom. This is the difficulty and the challenge of such an analysis. Prior to Cuba’s decision to suspend construction of the two reactors at Juraguá, numerous questions had been raised concerning the safety of the reactors, the lack of international scrutiny of the construction site, allegations of shoddy workmanship, and the potential for a “Cuban Chernobyl,” a mere two hundred miles from the southern shore of the United States. This section will attempt to clarify the risks and rewards of Cuba’s pursuit of a nuclear energy capability, including those related to nuclear safety, reactor design, the potential impact of a nuclear incident, and a summary of assessments of the state and integrity of the Cuban nuclear program. A review of economic constraints will focus on Cuba’s search for a legitimate source of financing to complete the project, as well as details surrounding the formation of the empresa mixta (a joint venture), the Juraguá Consortium between Russia and Cuba. Finally, this section will briefly touch upon the “impact” of the Helms-Burton Amendment of 1996, the political implications of Russia’s apparent re-commitment to competing Juraguá. In the search for a legitimate source of financing to complete construction of the Juraguá project it is necessary to discuss the nature of Cuban cooperation with the Russian nuclear firms, Atomoemergoexport and Zarubezhatomenergostroy, and the role that Russian specialists continue to play at the site. Both firms continue to have a limited number of engineers at the site (estimated at about 200) mostly working in a supervisory capacity. Numerous international firms have been mentioned as potential partners including Ansaldo SpA of Italy, Siemens KWU of Germany and Electricite de France (EdF). Yet, when these firms are queried about their involvement with Cuban nuclear plans, all deny that there are any plans to provide assistance in the reactor construction. Once this firm is found, any association would ensure that the third partner (tercer socio) of the joint venture (empresa mixta) would be first to recoup its investment in the project, the Russians second and the Cuban partner last. 24 The joint venture proposes to sell electrical generation to the Cuban state electrical power firm. From the time that the joint venture nuclear cooperation deal is finalized it would take approximately 36 to 42 months for operation to begin. This places the startup date at fall 1999 at the absolute earliest. The Helms-Burton Amendment of 1996 expressly proscribes any assistance to the Cuban nuclear program and seeks to penalize and states or firms with a dollar-for-dollar reduction in foreign assistance from the United States. Because Russia has committed itself to providing Cuba with assistance to finish the construction at Juraguá, and because Russia is receiving aid from the United States for its nuclear program, it is uncertain what this will mean for relations within this policy triangle. Compounding this uncertainty is the provision within this new law that exempts application of the penalties to aid to Russia covered under the Cooperative Threat Reduction (CTR) Act of 1991. Virtually all assistance going to Russia’s nuclear infrastructure is covered under the CTR. Moreover, Russia’s Ministry of Atomic Energy (MINATOM) operates with a high degree of autonomy that calls into question how effective sanctions emanating from the Helms-Burton legislation will be against the Russians. The uncertain international environment for accepting U.S. law, the increased Russian commitment to cooperating with Cuba, and Cuban resolve to complete Juraguá, set a complex of obstacles and imperatives before a rational resolution of the potential for a nuclear facility of questionable integrity. Three factors currently weigh heavily against the safety of Cuba’s nuclear programs. First, the fact that no comprehensive technological and scientific assessment of the Cuba’s nuclear facilities is readily available, gives rise to the uncertainty of the safety of its nuclear program. Second, claims and counterclaims about the shoddy construction and poor construction of the reactors at Juraguá suggests that there is a reasonable doubt for concern. Finally, Russia’s legacy in nuclear industry leaves much to be desired. Its intimate cooperation with Cuba compounds the already existing fears and opprobrium to the development of nuclear energy on the island. Although, preliminary assessments of the reactor design, the safety record of other similarly designed reactors, and the on-going development of Cuba’s nuclear bureaucracy, all suggest a positive movement toward a competent nuclear industry, legitimate doubts remain. Here, in a passing nod to Ronald Reagan’s position regarding Soviet compliance on disarmament measures, we can trust the Cubans are doing the right thing, but we must also verify that this is so. The loss of Cuba’s Soviet benefactor has rocked the Cuban economy. Moreover, it has forced the nuclear program to refocus its meager resources toward maintaining what facilities already existed and hoping to be able to conserve its partially constructed reactors until such time as it could secure financing for the completion of the projects at Juraguá. The constraints are considerable and suggest that if Cuba intends to complete Juraguá, many of the procedures associated with a safely operating nuclear facility will have to be compromised. This is a realistic suggestion when one sees how much difficulty Brazil, a country with a significantly larger economy, has had in completing its own civilian nuclear energy reactors. The economic rationale of nuclear energy development in Cuba has always been questionable. In light of its recent economic difficulties, and its growing inability to maintain energy sufficiency, its decision to continue this pursuit is understandable yet is a high risk for completion. The resources that have applied to this pursuit may have been put to better use in the development of other sources of energy. When assessing Cuba’s continued pursuit of nuclear energy one must seriously consider how much political capital it could earn by completing the project. Domestically, it would be a gold rush of sorts, the ultimate show of defiance in the backyard of Los Señores Imperialistas. 25 Here it matters little how efficient these reactors would be. The idea of such a high technological accomplishment becomes the highlight of the success of the revolution. Internationally, there is little opposition to Cuba’s attempts to develop nuclear energy with the exception of the United States. The potential for environmental disaster because of a nuclear incident exists but will most likely be concentrated in Cuba, devastating the island. The $800 million estimate from the Ansaldo feasibility study is conservative because there remain unanswered concerns about nuclear safety, no means of independent verification of claims and counterclaims regarding the integrity of the CEN Juraguá. It is important to remember that the IAEA is not a regulatory body in the strictest sense of the word. Although it provides services for operational safety and review assessments, its primary function is that of promotion of nuclear power, providing monitoring and verification against proliferation of nuclear weapons capabilities. Moreover, even with the establishment of new agencies within the Cuban government for the environment, nuclear safety, and material control and accounting, questions remain regarding the competence of such agencies and their inherent ability to meet internationally recognized standards of environmental protection and nuclear safety. This is especially relevant in the wake of the Chernobyl experience and because of Cuba’s close cooperation with Russia in the area of nuclear energy. Moreover, Espino, Díaz-Briquets, Pérez-López and others, assert that Cuba’s over reliance on symbolic undertakings often negate and are in essence immune to the clearly definable environmental considerations. By continuing to keep the project in the state of “suspension” or “conservation,” the Cubans keep open the possibility of finding a source of financing the completion of the nuclear project. The negative implication of this alternative is that it does little to assuage the concerns of the international community regarding the integrity of the Juraguá construction site. Russia’s renewed commitment without the requisite financial resources, relegates its capacity to assist the Cubans, to a symbolic gesture of friendship. This is by far the least costly of the options presently available to the Cubans. Choosing this option raises the specter that continues to be a source of much of the criticism related to Juraguá, that of inadequate storage and deterioration of mechanical equipment. If at such time that Cuba finds the means to restart construction, its engineers may find that the equipment has been irreparably damaged by the elements. Here the Cuban nuclear program may find that even with financing secured, the cost of repairing damaged equipment may place completion of the reactors at Juraguá out of reach. Pursuing this option also means that no comprehensive technical assessment of the site will be forthcoming. In this absence, there can be no verifiable and internationally recognized nuclear safety regimen that adequately responds to all the concerns regarding CEN Juraguá. Yet this alternative remains the most acceptable to critics of the program for the time being because its signifies that there will be no movement toward completion of this venture. It remains a credible option for Cuban officials because it keeps a window of opportunity for external financing open. The Ansaldo feasibility study, while optimistic about completing the project, may have underestimated the costs of completing Juraguá because of the potential for the unforseen and hidden costs of back fitting, update and replacing weather damaged and poorly maintained equipment. 26 Maintaining the “state of conservation” does not allow observers of the Cuban nuclear program to get any closer to resolving the potential environmental problems that remain a mystery. Cuba’s efforts to institute bureaucratic mechanisms that address environmental concerns are laudable, but they are constrained in their ability to assiduously pursue and resolve environmental concerns. ty may result in an overwhelming public relations disaster of sorts for the Cuban leadership. While failing to finish construction of the Juraguá project would appear to be devastating setback for Cuba’s economic recovery, continuing to pursue a project that may never come to fruition, might prove to be costlier for Cuba’s long-term hopes for economic and fiscal stability. Committing almost another billion dollars to a project of questionable return would lend added credibility to the suggestion that centrallydirected command economies place symbolic emphasis first before any sound economic rationale. In the case of the Juraguá project, almost two billion dollars will have to be committed by a rather weak and indebted economy, before operation of questionably safe nuclear reactor could conceivably begin. The economic aspect of Cuba’s nuclear ambition is less than convincing. And still, the nagging criticisms regarding nuclear safety and the threat of environmental disaster remain. Addressing these needs might require Cuba to invest substantially more than the $800 million mentioned in the Ansaldo feasibility report before Juraguá-1 comes on-line. For critics of the program, this would be the best alternative and would essentially relegate the project to the “dustbin of history,” having been written off as a gross inefficiency and a poor energy policy option. This would not in any way lessen Cuba’s dependence on oil. The recovery of the present economic system, and introduction of a market or mixed economy will require fossil fuels for the time being. Cuba will still be forced to develop alternative sources of energy that could help it meet its energy demands with the least amount of environmental degradation. This is the most important decision that confronts any choice related to energy and energy development on the island. Cuba has the most to gain from the development of energy self-sufficiency, but also has the most to lose from it. Unfortunately, poor execution of an nuclear scheme could have virtually permanent and irreversible consequences. Rather than hold out any policy option as the best option, the purpose of this examination has been to weigh the risks and rewards of some of the potential policy alternatives presently available in the case of Cuba’s nuclear energy policy. The overriding concern of this examination has been to provide a clear exposition of the environmental impact of developing nuclear energy in Cuba. This has only been partially accomplished. What is readily apparent from this analysis is that it is not a simplistic choice of one option over another. There exist a multiplicity and overlapping of interests and imperatives that compound the decision-making process. Unfortunately these approaches are often at loggerheads and have had the effect of placing the issue into a zero-sum context. What has often been lost in this equation is the effect that all of these competing interests have on the Cuban population itself. The unreliable sources of energy impact the Cuban society most. The potential for an environmental cataclysm will effect this very same group the most. Presently, the inability of the Cuban government to resolve the energy crisis and to provide adequate and verifiable environmental protection for its people is justifiably reason enough for close scrutiny of its nuclear aspirations. The absence of the constructive confidence-building measures in the Caribbean Basin, especially as they relate to Cuba, exacerbates the problematic relationships in place and only serves place an adequate resolution of this situation beyond reach. Although it lies outside of the realm of political possibilities for the time being. A resumption of technological and scientific exchanges between the United States and Cuban nuclear communities would provide the most tangible means to assuaging the fears of a nuclear disaster in Cuba. This would not be something new. In the late 1980’s, the Nuclear Regulatory Commission and officials from Cuba’s Secretariado de Energía Atómica Nacional (SEAN) conducted exchanges and visits to facilities in both the United States and Cuba. The purpose of the visits were mostly for information exchange. Re-institution of the exchange program could provide a means of conducting the proper scientific assessments of Cuba’s nuclear facilities that are certainly of great importance to all interested parties. Such a program of education and consultation would seek to make individuals aware of problems and opportunities that lie outside of its sphere of policy alternatives presently available. It also serves to provide additional training and professional education in areas that demand a high level of competence and responsibility. This process involves a full assessment of the present state of affairs at the reactor sites, and all associated bureaucracies. The two most important products of such an undertaking are: (1) a clearly defined set of scientific analyses of Cuba’s nuclear program that includes potential for reward and the potential for environmental risks and hazards from the exploitation of nuclear energy; and (2) the potential for changing values about the integrity of nuclear energy, in general, and in the integrity of the reactors at Juraguá. When provided with such information all interested parties can openly discuss the true nature of Cuba’s nuclear policy. Until such time, even under the most optimistic of political environments, the discussion of the subject will be an exchange of partially substantiated claims and counter-claims, if that.